Yes, I am finally showing a charity quilt that I made. 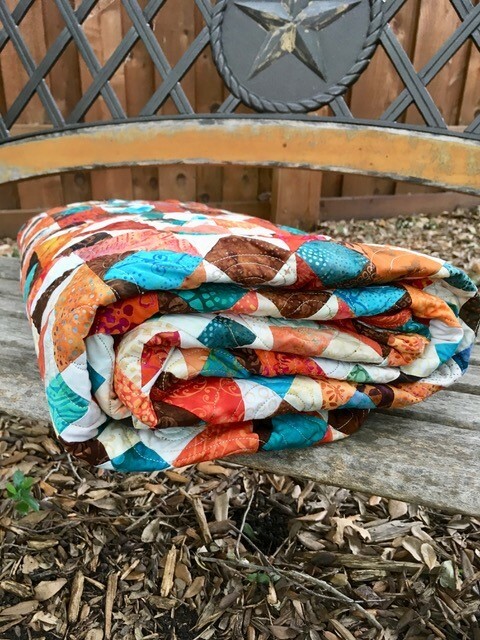 Do you recognize On Ringo Lake, Bonnie Hunter’s mystery quilt in 2017? I made this one with batiks. 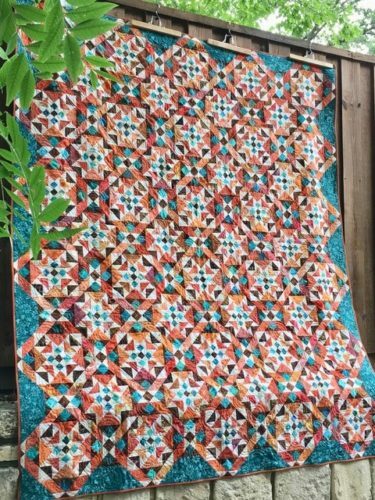 The quilt was fine but I wasn’t head over heals in love with it….I was in a rut. My shoulder felt awful about the time I was done sewing it and I thought “what the heck”…I’m sending this on to Cheryl. I knew she’d find a good home for it…and she did! I sent the quilt top to Cheryl in Dallas for quilting and binding. Cheryl likes larger quilts and this one measures 76” by 90.” A nice twin-size quilt. 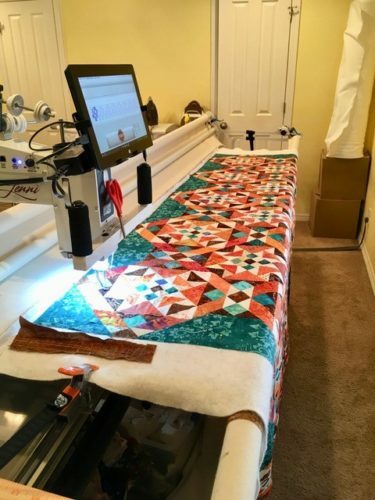 Above, the quilt top that was pieced in Iowa and designed in North Carolina is loaded onto a longarm machine in Texas. 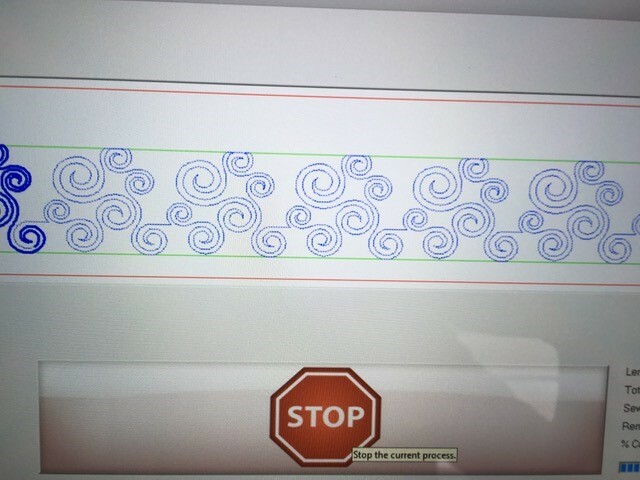 And the quilting begins. 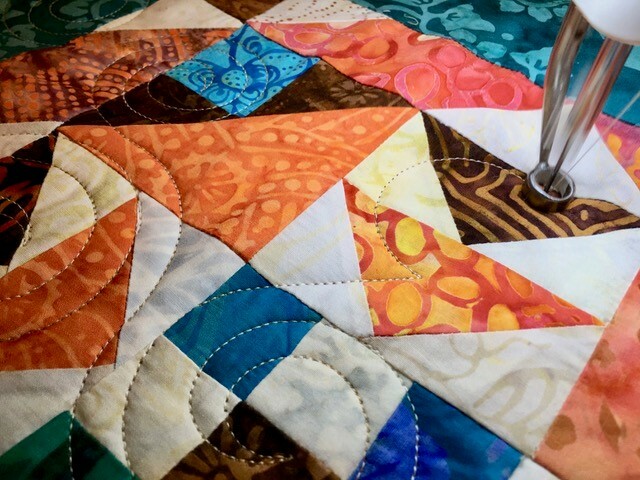 Cheryl told me that it takes her a long time to quilt even with her longarm machine because everything has to be perfect. It takes all kinds, doesn’t it? We each love a different part of the quilt-making process. The quilting pattern shown above is “Denise’s Spirals” by Denise Schillinger, available at Urban Elementz. I like how the spirals provide a contrast with all of the sharp angles in the quilt pattern. More stitching. Almost at the finish line. Without more ado, here’s the final reveal. Doesn’t it look great as a completed quilt? No pride of workmanship on my part. Ha! 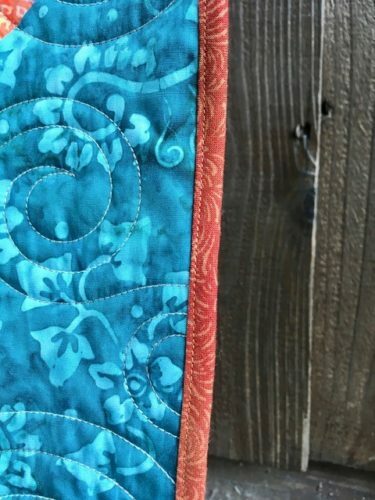 Cheryl used fabric from her stash for the binding. 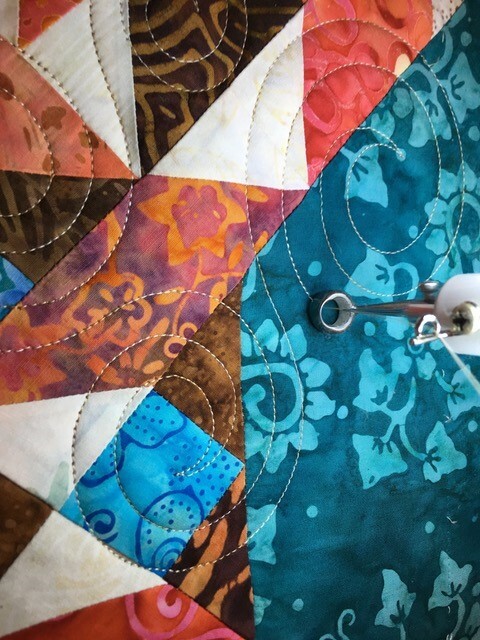 Although the binding is not a batik, it looks pretty good on this quilt. Another coincidence about the brown backing. I ordered this from Quilted Twins back in October and sent it to Cheryl in Dallas to help with her charity projects. Isn’t it the perfect match for this quilt? I love how these things come together; so many quilters working together for common goals. It’s fun and it provides a blessing for the recipient. This quilt is going to Gainesville, Florida, where it will be featured in the Christian Women’s Club raffle in November. 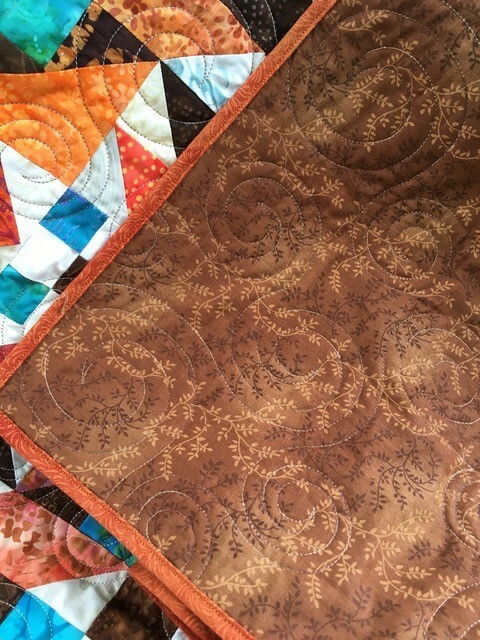 The raffle features lovely items purchased specifically for the raffle, and a homemade quilt is always included. Cheryl said the ladies LOVE to examine the quilt before the meeting, and everyone gets in on the action to try to win it. 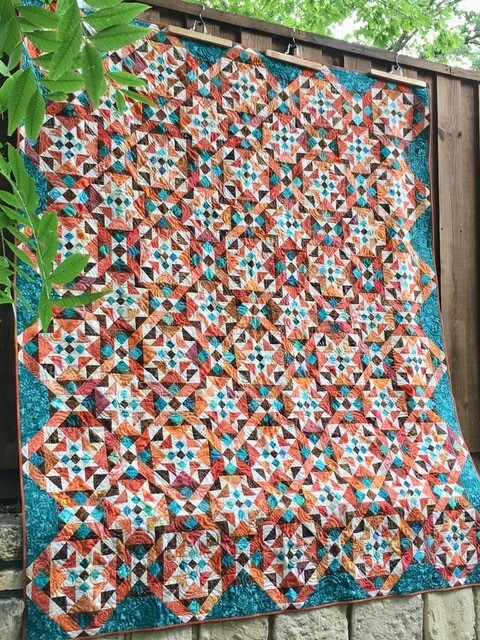 I am so happy that this quilt is moving on to a good place. Let’s hope the bids are high and lots of good can come with the money it brings in!! 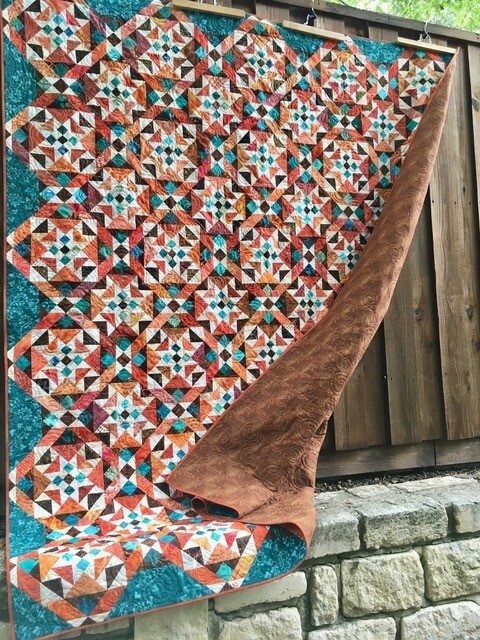 I was thinking about skipping out on the mystery quilt this year. Now I’m thinking I should do it….I can always ship it on to Cheryl and she’ll do good things with it!! Thanks a million Cheryl for making my quilt look so-so good! !